No music today, but it’s for a good reason. Kenner is a friend of the family. Kenner is an exceptionally bright young man, and very well spoken too. It’s not easy though. Kenner has autism, and his service dog Ivy has completely changed his world from night to day. A Human Rights Tribunal is currently deciding whether Kenner should be allowed to have his service dog in school. I know, right? If you have ever been around a service dog, you know they are unobtrusive, however the Waterloo Region Catholic District School Board has decided that Ivy is a “distraction”. They have ignored the professional opinions of Kenner’s doctors and of the Lions Foundation of Canada Dog Guides. So far, Kenner’s family has been fighting for three years. Three years for the basic right to have his service dog with him in school. Three years. You can read all about Kenner and Ivy here, and here, and here, and just about everywhere else in the news. A good samaritan named Jolene has taken Kenner’s plight to heart and has organized three rallies. The last one was on June 19 2017. The school board was assailed by cheers, honking horns, and best of all, a motorcycle “slow race”. It turns out that Kenner has support everywhere. We even saw people come from Kalamazoo, Michigan. Most exciting were the bikers from several clubs in the region. I saw Halton, Wellington, and a local club too. We were treated to some very loud bikes and the guys were just awesome. The kids loved the motorcycles, and Kenner got to sit on one. I’m posting this video in support of Kenner, while the Tribunal takes its time making this decision. My brother and sister-in-law used to train service dogs. The last one helped an autistic boy in Nova Scotia. Before he got Daisy, the boy would run away and cause area wide searches and panic for his family. Since he got Daisy he has never done this, and is better adjusted in society. I say austistic children need service dogs. They are not a distraction, they are like a medication that a person needs to survive. I am actually ashamed to say my daughter goes to a school in this board. The same one that allowed a police officers son to bully a child and did nothing. Just like Triumph says fight the good fight. I forgot to mention. The child that was bullied at my daughters school is autistic. Go figure. As if autistic families don’t have it hard enough. You said it best. A service dog is medicine. The school board is living in the dark ages. Same church that tool centuries to apologize to Galileo! I won’t get into the religious part of it because that part is off topic and not relevant. Suffice it to say that we are not religious people. We just felt the Catholic school was a better opportunity for her, and I happened to be raised Catholic. On a side note, when this issue began I told my friend who has a chilf with issues and he said he saw the schools point if kids are afraid of dogs. I was shocked. I would have assumed he sided with the Fee’s. Do I guess it is not completely black and white. My argument against that is two fold. I too was scared of dogs as a kid. But a service dog is different. It is trained to be unobtrusive. It’s a good way of getting over fear. Two, what a learning opportunity it would be to have a service dog in a classroom! A learning opportunity I never had! I told my buddy the school has numerous classes for each grade. Have 1 that has service dog(s) if applicable. Then let parents know up front and if they or the child is concerned, they can go to another class. The school board is run like government though. What they say goes. If the public objects they will do a closed door meeting to bully rules that go against public opinion. It’s pretty sad to me, that empathy doesn’t seem to compute to them. Not to mention the hypocrisy. “A PLACE FOR ALL” indeed. They are currently boasting that they accommodate students with mood disorders. But autism? Naaaah. Service dogs are weaned out and tested for years. Any dog that is not 100% is taken out of the program. The other issue is probably insurance. I bet if the school board “loses” this they will force the Fee’s or anyone else that has a service dog to have their own insurance,.and will try and deny any responsibility. I support Kenner and Ivy too. It is outrageous that the board has taken so long to make this decision. This is a no-brainer. Many people with Autism find animals therapeutic. The one gentleman I work with has a love for cats, especially Siamese ones. Kudos for bringing this to the front and give Kenner all my support. I hope the fat heads on the school board change their decision. Thanks! Glad to have another supporter for Kenner! Has there been a petition started on Change.org? I am not sure. I do know this has become national news. What do those petitions do? They’re supposed to go to the people whose mind you want to change. In this case it would be the Catholic School Board. Right now the organizers are putting together a Go Fund Me for the family to help pay their legal fees. The Tribunal will not make their decision until the end of 2017. That means Kenner will have to start ANOTHER school year without Ivy. As a former military man, you may have heard about the benefits for veterans with PTSD. Soldiers are also faced with this kind of BS beauracracy, and it is all wrong. I’m sure the family appreciates the support from across the pond. Great article by D’amato in today’s Record. My heart is breaking. They want to give Kenner easier lessons. That’s a solution??? I read the article in today’s paper. My heart is breaking for Kenner and his family. I understand why they want to fight this but Kenner is not doing well in school without Ivy to keep him calm. I would be very tempted to just give up and send him to the public school, where Ivy would be allowed in the classroom. I just do not understand why the Catholic board is so bull headed. Are they not supposed to offer a Christian education? Is part of that not compassion and empathy? Thanks, I believe in this case strongly. The argument about the dog being a distraction is an absolute joke. It may be for the first few days, and then the shine will wear off. The kids will be used to the dog. How about the distraction a severely autistic child can make multiple times all day/every day? Calm the child down and the distraction is gone. Latest update: The closing arguments from the school board are that Kenner is not the dog’s handler (Ivy has a handler) and the school is not a public place. The school is not a public place. That’s right, that is the closing argument. But it could be argued Ivy is Kenner’s handler, so get on with it already I say! I support Kenner and Ivy. Every child deserves the opportunity for education, and it appears Kenner’s family have gone above and beyond to ensure he gets the best education possible. Do know from first hand experience how frustrating it can be raising a child with particular needs and receiving veiled sympathies/understandings and behind yer back chatter from fellow parents community and organizations. Not only do I support this but I applaud this stance taken on behalf of Kenner Ivy and their family! Every child deserves a chance at a good education Mike! That’s right Wardy, he deserves to get his full potential in education! They want to simply his lessons. That’s just not right! He’s not stupid — he gets scared and frightened! In a sense it is not exactly “public” like a library or a.park. Therefore, unwanted adults can not just wander the halls. However, the school is using this loosely based veil that is meant to protect children in the wrong way. They are using it to cover their own asses because now that they have dug their heels in, and public opinion is agsimst them, they are grasping at any straw to win. Unfortunately, I think the school board will “win” and everyone else will lose. The nature of the work I do is to support students with disabilities, albeit in the post-secondary sector. I really hope the OHRT sees it fit to allow Kenner to have his service dog in class with him. I have seen many service dogs come through my office, and they are gentle and they behave. Like Bop said, they go through stringent training to ensure they are not a distraction. 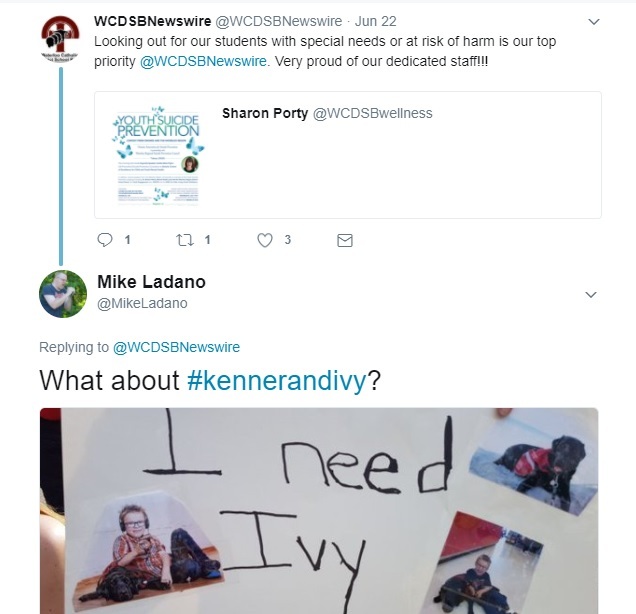 Like a Blind individual needs a service dog, I do believe Kenner needs Ivy. I have seen how support dogs can help. And about the “fear of dogs” issue…I too feared dogs. A support dog is a great introduction to teaching kids how to overcome their fear, and to also teach them respect, impulse control (don’t touch Ivy while she is working! ), and compassion that they can help kids like Kenner get through everyday life. Not bad life lessons! I think too the school fears that if they let Ivy in, every parent will insist their kid deserves a service dog, thereby resulting in a classroom of dogs…so the heck what? Craig read your comment and appreciates it!